Here's the new 2.32-ounce Samsung SGH-E590. Designed by Jasper Morrison, the SGH-E590 has... hrmm... things. You know. A screen. Some buttons. A camera, too. It has panorama functions and stuff. And it comes with a special rubberized bean bag that acts as a tripod or something. And... whatever. Not even the mention of a rubberized tripod excites me after the new Messiah-Phone ads. Still, a nice minimalist cellphone that comes loaded with features. It will be out in Asia and Europe this June, but who cares: the American people will have the iPhone! Or at least, some ads. 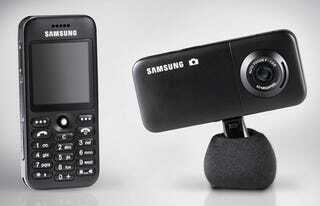 Extra pics and complete features of the Samsung SGH-E590 after the jump.